Civil litigation is the legal term for a case in which neither side is facing criminal charges. Civil litigation involves a party who has a legal dispute with another and is seeking recompense in the form of money or a change in the other party’s behavior. 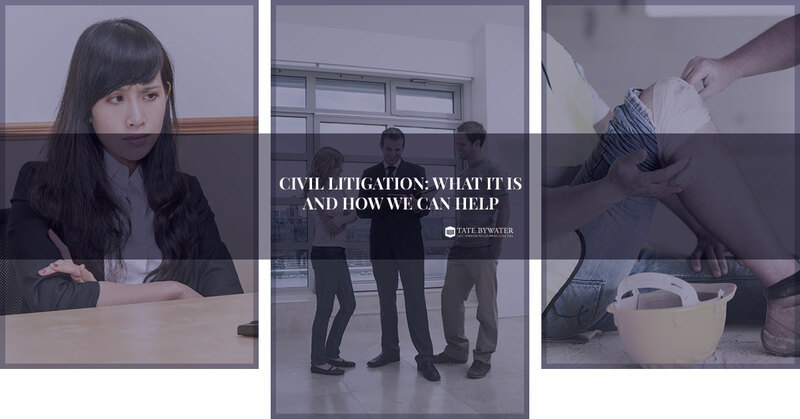 At TATE BYWATER we understand that every civil litigation case is different. Some cases will require a litigation lawyer who takes an aggressive approach, while others will require a steadier hand in order to find a solution that most benefits our client. The important thing is to know which is best in each specific situation. While many cases are settled out of court, a good civil litigation lawyer will know when it’s in your best interest to take the case to court. Below are some of the most common forms of civil litigation we handle. Real Estate – If a real estate deal goes sour, either before or after the sale, it’s important to have a dedicated civil litigation lawyer on your side. Business Disputes – When one party isn’t performing according to the points of a legal contract, it’s perfectly logical that legal action might be needed. Personal Injury – While the police might have been involved in order to verify an accident, it doesn’t mean that criminal charges will be filed. If you’ve been injured (or believe that you’re being wrongly accused of injuring someone), TATE BYWATER will be on your side. It doesn’t matter how small or large the case is; the litigation lawyers at TATE BYWATER are ready to help you get the justice you deserve. Whether you’re a defendant or plaintiff, Contact Us and we’ll help you negotiate the legal system.